While packing my baking pan drawers, I found this bundt pan that my sister in law helped me to buy while they were back for a holiday two years ago. You guess right, it has been a white elephant in my drawer for TWO WHOLE years! Back then, the baking supply shop in Bt Timah that stock a wide variety of bundt pans wasn't in operation yet and that was why I asked her. One thing for sure, it wasn't an impulsive purchase though. 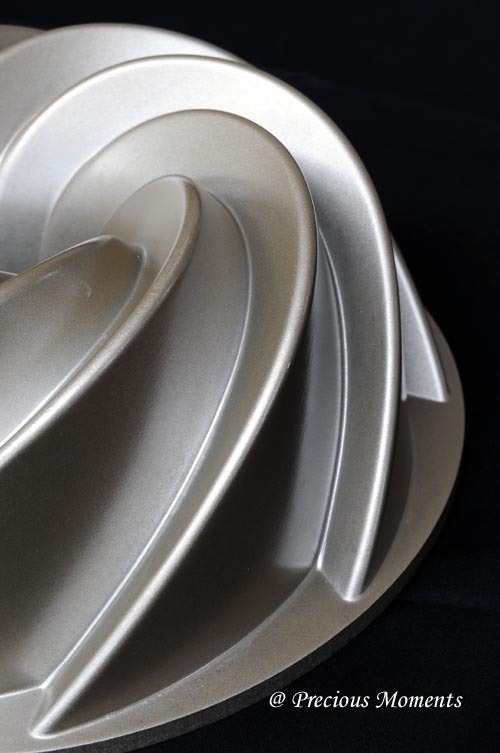 I just love the heavy feel of this baking pan and the sharp lines that it create speaks volume of a good quality pan. Anyway, am trying to clear my pantry and fridge. Had so much leftover egg white that I was wondering how else I can use them quickly besides baking macaroons which I am sure these will be super liked by son. Found this on the cyberworld and it looks really pretty. 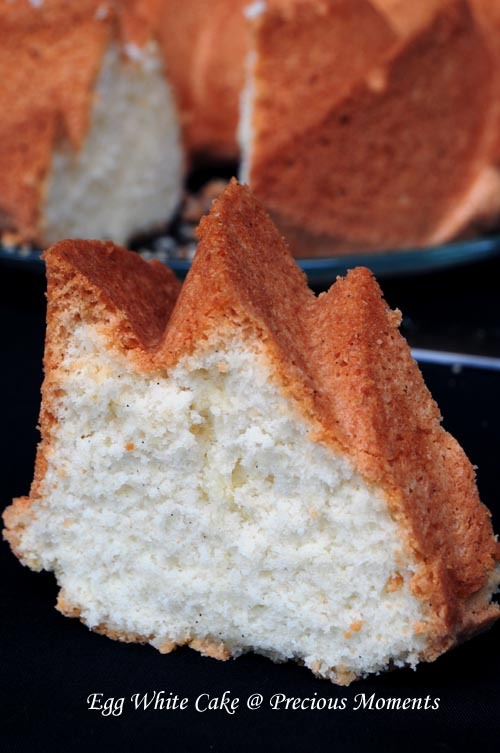 The crust contrasting with the inner texture of the cake. It is soft but I think it is good if we pair it off with some fruit frosting. Preheat oven to 180 deg. Whisk the egg white till foamy and add in the 2 tbsp of sugar. Whisk till stiff peak. Sift plain flour, potato starch and baking powder. Add the remaining sugar to the flour mixture. Fold in the flour mixture into the egg white mixture. Lastly fold in the melted butter. Pour batter into the greased mould and bake for 30 - 40 mins or till golden brown. 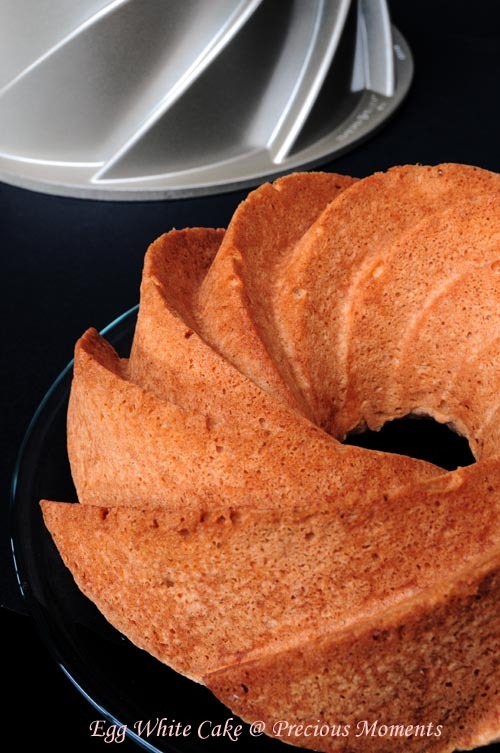 That is the absolutely gorgeous Heritage Bundt Pan from Nordicware, which I have too! I got it shipped over about 3 years ago because I loved it so much, but have only used it twice :-( because I don't make many Bundt cakes (they are huge) thought it remains one of my favourite pans. At that time it was also available from the other supplier at The Adelphi at their usual overpriced tag, but now the prices of Bundt pans at Bukit Timah are enough to make one cry and buy ;-P Luckily I have some discipline nowadays, enforced by my wallet, LOL. You have successfully tempted me.I'm not one for bundt cakes but seeing the fluffy cake, I might give it a try. I love this pan. Always wanna get it..... After seeing yours, I think I will go get it! !